Here is a dispatch from intern Casey Rogers. Casey is a senior at the University of Maine, studying social work, and is spending this academic year as a field practicum student with Maine Family Planning. Earlier this fall, I had the fortune of attending the Maine Women’s Summit on Economic Security. When I first read about the summit, I was excited for the opportunity to hear two amazing women speak on their experiences in leading major social justice movements in the U.S. The first of these powerful women is Alicia Garza, a co-founder of the Black Lives Matter Movement. During her talk, Garza reflected on her experiences that led to Black Lives Matter, and I was moved by her strength, eloquence, and wisdom. It’s important to note that Black Lives Matter is a movement that was started by three Women of Color, and one that fights for all Black people, including women, queer and transgender people, poor people and immigrants. The second speaker is the amazing Loretta Ross, a professor at Hampshire College and co-founder of the SisterSong Women of Color Reproductive Justice Collective. Reproductive Justice is a movement also founded by Women of Color, and one that merges reproductive rights and social justice within a human rights framework. 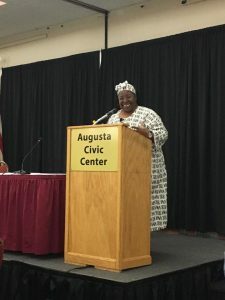 Loretta Ross, a co-founder and former national coordinator for SisterSong Women of Color Reproductive Justice Collective, in Augusta last month. Garza and Ross are two powerful women in the fight for racial and reproductive justice. However, while they share some common goals, the process or paths they take may differ due to many factors, including being from two different generations, growing up in different areas, and, of course, being two different people with unique experiences. I felt that Ross touched on this well when she said, “If I only worked with people whose minds worked just like mine, I’d have a movement of one.” As a social work student, I’ve had discussions with my classmates on our tendencies to assume the people around us think exactly as we do. In reality, while we may have common goals surrounding justice and social growth, we may also see different paths to these ideas. A strong point to take away from Ross’s discussion is not to debate what “type” of feminism or advocacy is the best, as the energy spent doing so only takes away from the goal, whether your goal is getting certain policy passed, or changing the dialogue around a social issue. As Ross put it, “calling each other out on not being ‘woke’ enough is not helpful.” She discussed our need to change the dynamic from “calling out” to “calling in.”Both leaders centered feminism and intersectionality, and what these concepts mean to them, in their discussions. Garza commented on our need to redefine feminism to better address intersectionality, as feminism is not about just one issue. Looking through an intersectional lens means recognizing that we all have many aspects to our identity: our race, sexuality, gender, and socioeconomic class. It also means analyzing how these aspects intertwine, and how we may experience power and privilege in some ways, while experiencing powerlessness in others. A lot of what Garza said about intersectional feminism strongly resonated with me. I believe, both as a future social worker and as an individual, that you cannot look at one aspect of a person’s identity and expect to understand the bigger picture. When Garza described intersectional feminism as “transformative” and the “feminism that could free us all,” I was very much on board. Loretta Ross brought another perspective to the table. Ross prefers the term “justice feminism,” adding that “intersectionality is a process, human rights are the goal.” Ross calling herself a justice feminist reflects her feminist goals, while practicing intersectional feminist analysis better describes the process. It’s easy to write someone off because they are not on the same page, or they said something wrong, or because they come from very different experiences. However, when we’re put in a situation where we can “call in,” we may be surprised by the change we are able to make. This fall, as part of my internship, I participated in outreach work with the Mainers for Healthcare Campaign. When I started, my supervisor and MFP’s Community Organizer, Cait Vaughan, went through a canvassing training with me. Cait explained that while many interactions will be positive, that might not always be the case. She then gave me a piece of advice that really stuck with me, which is that people may say things that feel like they’re coming from a place of anger, when they may actually be coming from a place of fear, or having misinformation. It’s easy to react to anger with anger, but if we are able to stop and ask questions instead, we are also then able to meet the person where they are in how they are honestly feeling. Weeks and several canvassing shifts later, I have had a few of these interactions with folks where someone made a cringe-worthy comment, and while it was difficult not to feel upset, I did my best to engage with them and ask questions. With all of this said, I feel it is also important to note that we are not always able, nor are we ever obligated, to “call in.” While I agree with the notion of leaning in and asking questions when we are able, call-in culture should not come at the expense of sacrificing one’s values. We should always leave room to allow ourselves to draw a line and exit a conversation if someone really is coming from a place of anger, hate, or aggression. Being able to attend the Maine Women’s Summit on Economic Security and experience Alicia Garza and Loretta Ross’ talks was an amazing and inspiring opportunity. Seeing so many strong women from Maine, the country, and the world was a wonderful experience to take away from my field placement with Maine Family Planning. It gives me hope for my community and excitement to go out and work with some of these amazing people in my career.